According to the Associated Press, the infamous FEMA trailers are headed back to Louisiana to help provide temporary shelter for the thousands of displaced residents that remain stuck in shelters, living in hotels, or staying with family and friends after flooding ravaged their homes, creating a housing crunch that may bring back temporary housing units like those used after Hurricane Katrina. 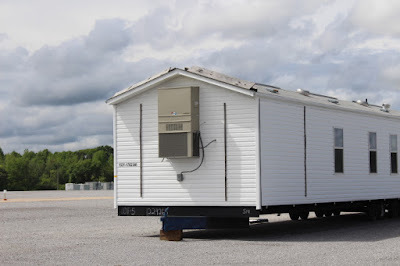 Just don’t call them FEMA trailers. Instead call them modular housing. I guess if the temporary home looks more like a jobsite trailer than the FEMA trailers of yesterday you can call it modular. Nothing hurts the real modular housing industry more than being linked to pictures like this. The much-maligned trailers that filled front yards and miles of vacant property in south Louisiana and Mississippi a decade ago became a symbol of everything that had gone wrong with the federal disaster response to the 2005 hurricane. The trailers drew health worries after toxic levels of formaldehyde were found. Governor John Bel Edwards stressed that he prefers a quick way to make homes habitable but he acknowledged some sort of modular housing may be needed that people can set up in their yards while repairing flood-damaged property. Louisiana Governor John Bel Edwards announced the "Shelter at Home" disaster recovery program Wednesday. According to Edwards, FEMA will fund up to $15,000 to render a home "safe, secure and habitable." The program will only be eligible to people who's homes can be restored to basic living condition, for $15,000 or less. The governor also announced two interim housing options for flood victims. Those programs include U.S. Department of Housing and Urban Development approved mobile homes. Edwards said FEMA "trailers" available to flooded families will be "very different" than those used following Hurricane Katrina. Those FEMA homes will be available to families with homes facing more than $17,000 in damages. However, those FEMA homes will not be able to be placed in flood zones. The Democratic governor unveiled a package of transitional housing programs Wednesday that his administration and the federal government have developed. Federal Emergency Management Agency Administrator Craig Fugate has pledged that any temporary housing units that will be offered will be ‘‘much improved” modular housing, not trailers. A question nobody can answer is what will become of them after the 180 days? Will there be acres of them setting vacant waiting to be sold in bulk like the Katrina trailers? Maybe FEMA could refurbish them, put them in storage and have them at the ready for the next disaster. Wait a minute, that would never happen as it actually makes sense and FEMA has never been known for that.